April 10th, 2019 – Aroma Bit received Best Innovative Sensor Technology Award at IDTechEx Sensor Europe held in Berlin, Germany. 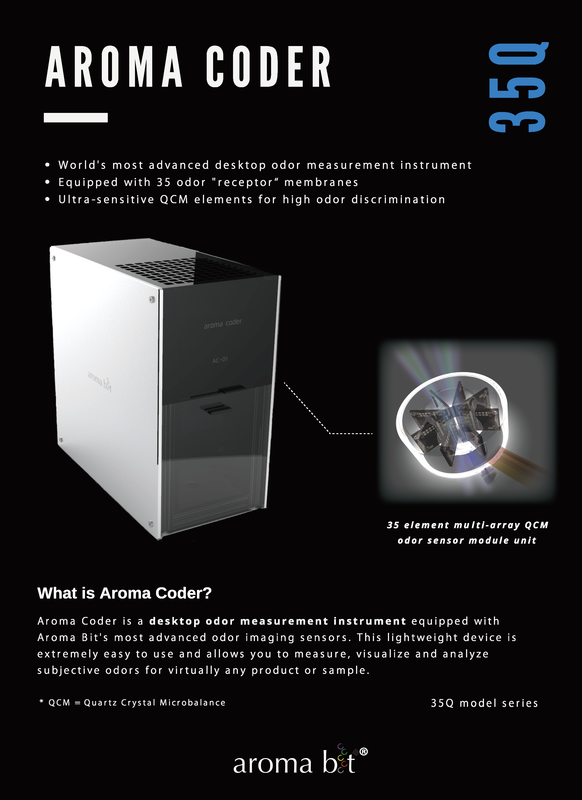 March 4th, 2019 – AROMA BIT, Inc. (hereafter Aroma Bit, Chuo-ku Tokyo, Representative Director Shunichiro Kuroki), a leading provider of compact odor imaging sensor and innovative service using the sensor, today announced that the company conducted the allocation of new shares to a third party. The allottees are Sony Corporation’s corporate venture capital arm, Sony Innovation Fund (hereafter Sony) and existing investor. Aroma Bit developed compact odor imaging sensor is a unique odor sensor device that outputs visual pattern when exposed to various odor, mimicking living olfactory system, unlike conventional gas sensors which specializes in detection of pre-targeted chemical compound gases. Increasing market tractions from global top tier customers in the area such as food and beverage, consumer goods, cosmetics, industrial machineries, robotics, mobilities, healthcare, agriculture, marketing, among others, is suggesting stronger-than-anticipated rise of digital olfactory device market and confirmation of Aroma Bit’s technology competitiveness. In meeting market’s increasing demand, Aroma Bit has introduced the following new products in December 2018. Furthermore, during 2019, Aroma Bit plans to initiate a new technology and business creation collaboration program. The goal of the program is to develop and establish industry-specific innovative solutions using Aroma Bit’s sensor and data with specific partner companies from various applications and industries. 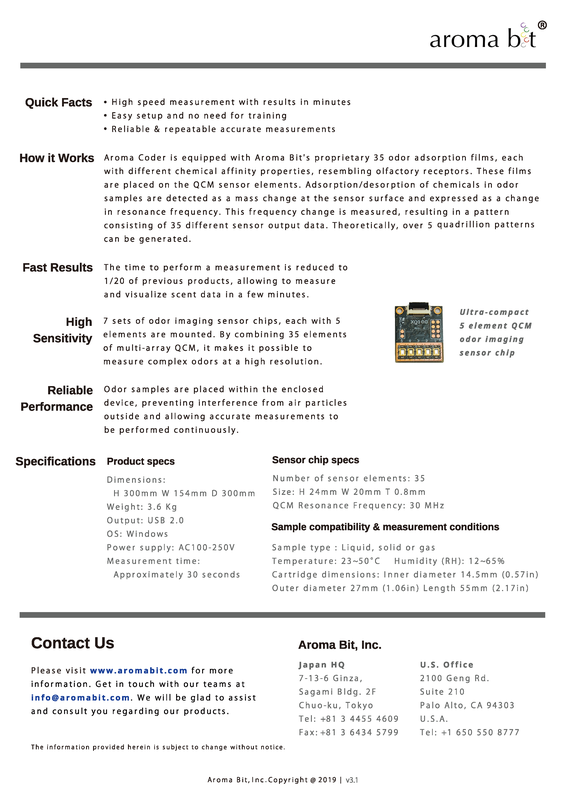 Aroma Bit designs, develops, manufactures and sells compact odor imaging sensor and innovative services using the sensor. Company Name: Aroma Bit Inc.
– Development, Production and Sales of electronics equipments and systems including compact odor imaging sensor. – Production, Development and Sales of innovative services using the Sensor products. – Other business related to the above. Established in July 2016 by Sony Corporation, Sony Innovation Fund engages with innovative early stage startups to help fuel development of ground-breaking technologies and launch new businesses. In addition to investment, Sony Innovation Fund closely collaborates with the startups in which it invests, offering access to Sony and its worldwide network, providing guidance and advice, and working collaboratively toward common successes. Business: Sony consists of the following segments: Mobile Communications, Game & Network Services, Imaging Products & Solutions, Home Entertainment & Sound, Semiconductors, Components, Pictures, Music, Financial Services, and All Other businesses.